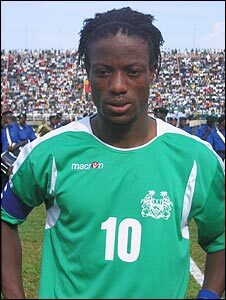 Sierra Leone striker Mohamed Kallon has resigned as captain of Leone Stars, following his team's exit from the World Cup and Africa Cup of Nations qualifiers. His decision to quit came just days after Leone Stars were hammered 4-1 by Nigeria - ending the team's hopes of reaching the final qualifying phase. "I've been doing a lot to develop the game in my country and ensure that Leone Stars qualified but the team was deliberately frustrated by the SLFA. "After all Kallon's assistance to the team, it is not the best way for him to bow out. "We'll encourage him to continue [to play] with Sierra Leone. This is not the time for a blame game but the time for better planning for the future." Kallon took over Leone Stars' captaincy in 2001 against Liberia in Monrovia.